My Road Trip playlist came together when I was travelling with my three oldest grandsons and wanted to share some of my favorite music with them. I’ve added a few things since I now use it when I drive the roads alone. I picked songs that keep me awake and remind me of old times along with the songs I love to sing along with. It’s something of a history of me. There are songs from junior high and high school. How about a little Buddy Holly that I played so much in 7th and 8th grade? Some old rock & roll with Jerry Lee Lewis (music to shock the parents with the loud pounding piano and “Great Balls of Fire” and “Whole Lotta Shaking Going On”) and Fats Domino, Little Richard and Chuck Berry. I had to explain to the kids that DJs were brave to play music from black artists, which my 19 and 20 year olds didn’t get understand at all. We were a dancing generation, so I’ve got some great anthems of my youth. “Do You Love Me?”, “What’d I Say?”, “Good Lovin'”, “Do You Want to Dance?”, “I Heard It Through the Grapevine,” and, of course, “Louie, Louie.” Hopefully other drivers don’t notice the old lady rocking out a little down the road. High School also brought us the Beach Boys, so I listen to “Surfing’ Safari,” and folk music, which took us to coffee houses and brought in social consciousness. I have some Bob Dylan, Joan Baez, the Kingston Trio and, probably my favorites, Peter, Paul & Mary. My concert days included all of them except Joan Baez. I went to this concert when I was a senior. For this list, I don’t have my Barbra Streisand favorites, but there are songs from Diana Ross & the Supremes, Credence Clearwater, and Simon & Garfunkel. It’s a hodgepodge for me to sing and think about. The years went by, and there are a bunch of songs from The Beatles, who we discovered our freshman year in college when they were on Ed Sullivan and then embraced from then on. And, to round it out, my country vibes are all out there with Willie Nelson, because, well because WILLIE! I’ve got some of his most fun songs to make me smile and sing, “I Didn’t Come Here,” “If You’ve Got the Money, I’ve Got the Time,” “Big Booty,” and “On the Road Again,” because you have to have that one when you’re driving. Some of these songs take me back to all the fun of dancing for hours with all my friends, some take me to the times when I listened to songs in my dorm room and tried to understand love, friendship and the world around me, some take me to concerts I attended (Bob Dylan, Willie Nelson, the Beach Boys, The Kingston Trio, Peter, Paul & Mary, and Paul McCartney) and some I just have to hear. I’m not even a bar person, but get a kick out of the drinking songs. I keep thinking of another playlist, but this one is so much fun that I haven’t gotten around to it. If you see me on the road, don’t laugh. Find your own favorites to sing along with and see if it doesn’t make the trip go a little faster! In the fall of 1957, I started 7th grade, a life-changing year. Up until then I had attended a small private school where I was in a class of 24, usually 18 girls and 6 boys, basically the same kids year after year. We had moved and my parents let us change to public school so we could meet kids in our neighborhood. I had no idea what that year would bring. I was not so much shy as a quiet observer, so moving from a sheltered world into a class of 650 in a school that was both junior and senior high was pretty exciting. I was thin, my legs so thin one of the guys used to call out “Hey Toothpick” when he passed me in the hall. My skinny legs along with my ever changing shape wasn’t so much embarrassing as awkward. Who didn’t obsess with it at that age? I was one of the youngest in the class, only 11, and had been playing with dolls until recently. I was a child, an oldest child, with not many older kids to show me what was next. Throw me into this sea of raging hormonal adolescence and see if I can float. 1957 couldn’t have been more exciting. Rock ‘n Roll was in a fantastic stage and our favorite radio station provided the beat of our lives. We took dance lessons and learned to dance with boys, cute boys, not so cute boys, soon to be cute boys. We learned the waltz, foxtrot, swing dance and cha cha that year, dancing them into our muscle memory so we could hear the steps in our sleep and even half a century later . And dance we did. There were school dances, dance school dances, and we had social clubs. We learned about popularity and being left out, about the awkwardness of asking someone to a dance or waiting by the phone hoping someone would call. Life was happening and we were learning all the lessons. We walked all over the place or our parents dropped us off to meet our friends. There was a new freedom of hanging out with a big bunch of kids. Our parents were suddenly not as fun to be seen with. The drive-in restaurant where we had always gone, Pennington’s, was also the coolest place to go for all the teens in the area. They cruised the lanes, looking for the perfect parking place, waving at their friends. When my father chose to park in the middle of them and wave as they went by in their convertibles, I sat on the floor, not believing he was doing this to me even though I didn’t know any of them and wasn’t old enough to be in cars with them. That day would come…later. On Saturdays, kids met at Utica Square, a fairly new shopping center. Our first stop was Utica Square Book & Record store where we would wait for the KAKC Top 50 list for the week. Here’s one from my junior year…I couldn’t find one from way back in 1957. The cool thing about the book & record shop (and I don’t remember any books in there) was the booths where you could crowd in with your friends and listen to the newest 45. I think they cost $1 back then. The music was crazy fun as we listened to Elvis, Buddy Holly, Chuck Berry, Fats Domino, Jerry Lee Lewis, The Everly Brothers, The Coasters. 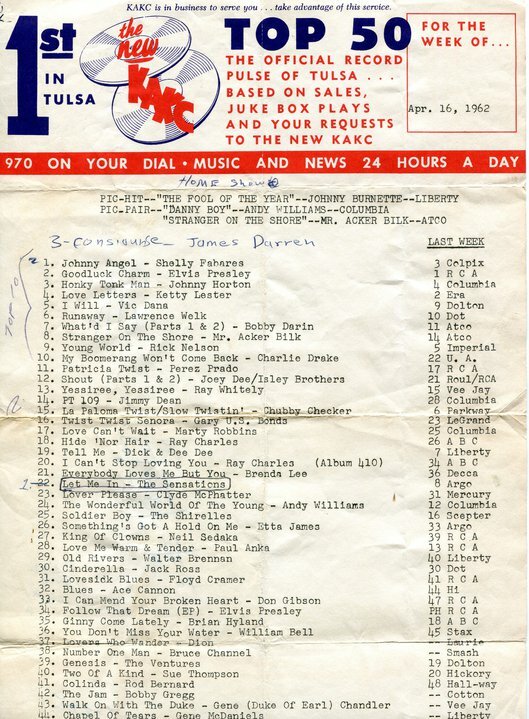 Some of our favorites in 1957 were “At the Hop,” “Whole Lotta Shakin’ Going On,” “Susie-Q,” “Great Balls of Fire,” “Searchin,” “Little Darlin’,” “Peggy Sue,” “School Day,” “Young Blood.” The Everly Brothers’ “Wake up Little Susie” was an exciting idea for an 11 year old. We knew all the words, playing records, listening to the radio, our hearts moving to this background beat of our lives. Suddenly my parents didn’t get the music or the slang we used. Everything was “stud,” which sounded horrible to my mother which certainly didn’t make me quit using it. We all dressed alike, a uniform different from the one I wore in private school. There were clothes that made you look like part of the group. You didn’t want to stand out. We wore penny loafers with the penny in the slot, bobby socks, hoop skirts for dances, pleated skirts. It was all changing. Kids would hang out around the neighborhoods, at each other’s homes. We also went from the book & record shop on Saturdays to Utica Bowl where the pin boys still set the pins. We would bowl a couple of lanes, eat in the little snack shop, hang out like real teens, which we weren’t yet. There were boys hanging out there, boys who all wore the same jackets, red jackets with the collars turned up for while. Some of them actually smoked. The kind of boys your mother worried about. Most of them were nice, just doing the teen thing. There was so much going on that year, so many changes in our world, in us. I watch my grandchildren growing up, going through those same times in their lives with a little bit of envy. Sure it was awkward, sure it could be embarrassing and emotional, but we were young and alive and open to what the world was throwing at us. There was so much we would face in the coming years, but this year was the first one. Looking back, it was a fun one even remembering the emotions, the awkwardness. We were young and excited. I can’t, wouldn’t go back to 7th grade. But I sure can look back with a smile at that little girl starting to grow up. 1957…7th grade…was important.